Over Autumn and Winter 2018 Span Arts and PLANED will be working with communities in central Pembrokeshire to create a beautiful interactive quilt exploring farming, life on the land and personal connections to the Preseli landscape. This is part of a wider Ein Cymdogaeth Werin – Preseli Heartlands Communities Great Place project, led by PLANED. Thanks to the funding support from National Lottery players, this project will deliver an exciting three-year programme of activities celebrating and sharing heritage in the Preseli region, making it a stronger visitor destination based on its unique heritage and culture. The project is a partnership made up of key local organisations involved in heritage across Pembrokeshire, and was granted £218,000 from the Heritage Lottery Fund, with additional funding from Arwain Sir Benfro and Pembrokeshire Coast National Park. 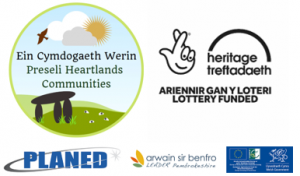 The Ein Cymdogaeth Werin – Preseli Heartlands Communities project launch is on Saturday 13th October at Maenclochog Community Hall, 1-5pm. Come along for an afternoon of tea and cake, a talk from community archaeologist Delun Gibby, an exhibition of old photos from the region and an opportunity to tell your Preseli Heartlands story. The event will kick off at 1pm with an introduction to the project followed by a Memories Tea Party from 2:30pm. The team is keen to hear from anyone with a personal story about the Preseli region and in particular want to gather memories of local places, people and lost ways of life. Bring along photos, objects and tall tales to tell! There are lots more ways to get involved in the Stitching Stories element of the project, contribute stories and help make a permanent piece of art-work representing the collective memories of the area: ‘Stitch Labs’ will be happening on alternating Friday afternoons in Maenclochog Community Hall led by textile artist Nia Lewis; Span Arts are running an ‘E-textiles’ workshop on Sat 20 October in Narberth with digital artist penny d jones; and ‘Stitch Your Story’ is a workshop for families and children on 2nd November in Maenclochog to create your personal Preseli Heartlands map. 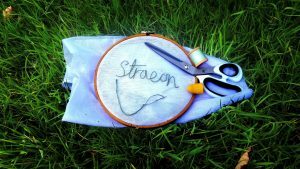 The Stitching Stories workshops are fully bilingual and you don’t need any previous experience to get involved. To register an interest or book visit span-arts.org.uk or call Span Arts on 01834 869323.